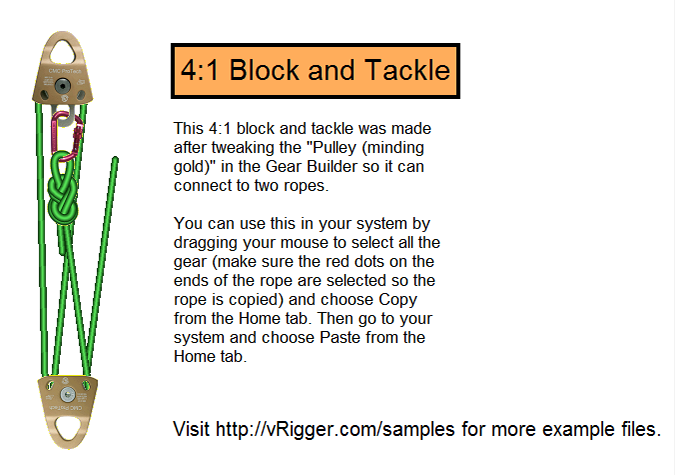 This page contains sample vRigger files that you can use with vRigger version 10.2. You may also be interested in the free training videos. If you create files that you think will be helpful for other people who own vRigger, please send them to us for possible inclusion on this page. Thank you. 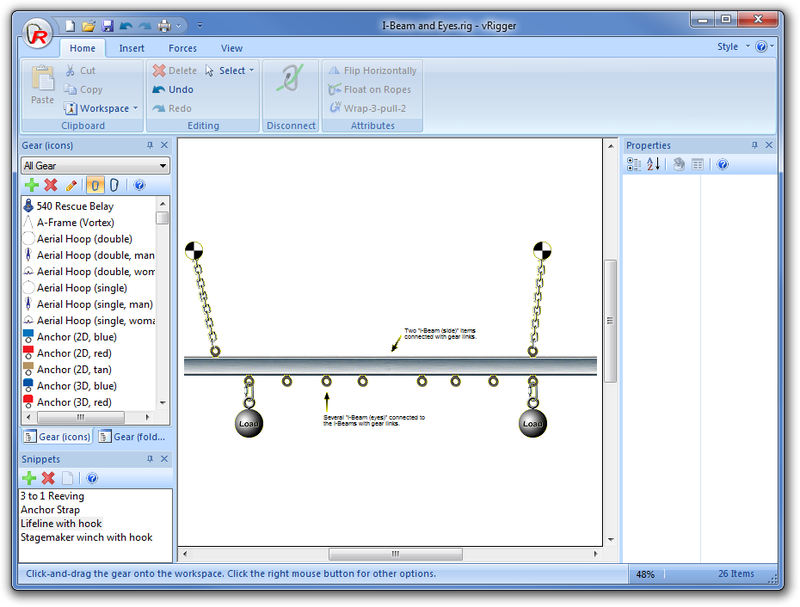 This file displays a 2:1 mechanical advantage system. 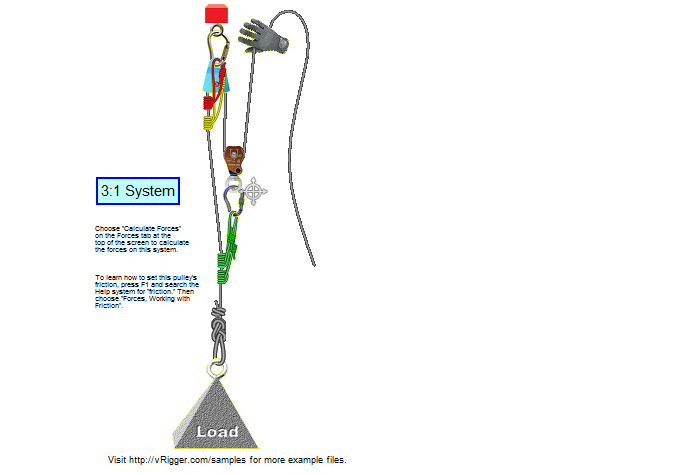 This file displays a 3:1 mechanical advantage system. 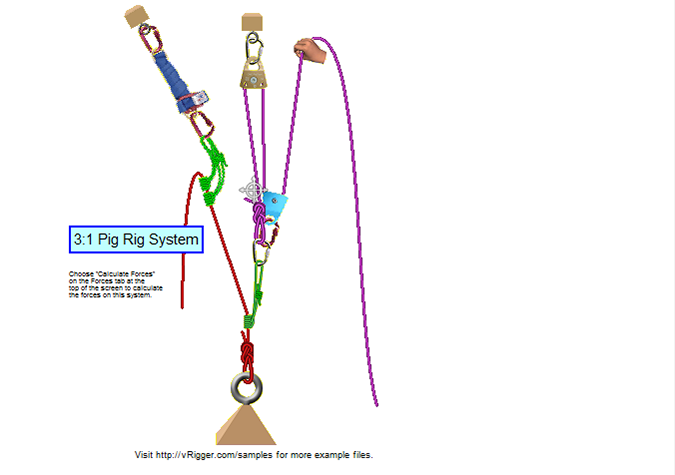 This file displays a system with 3:1 piggyback system mechanical advantage. 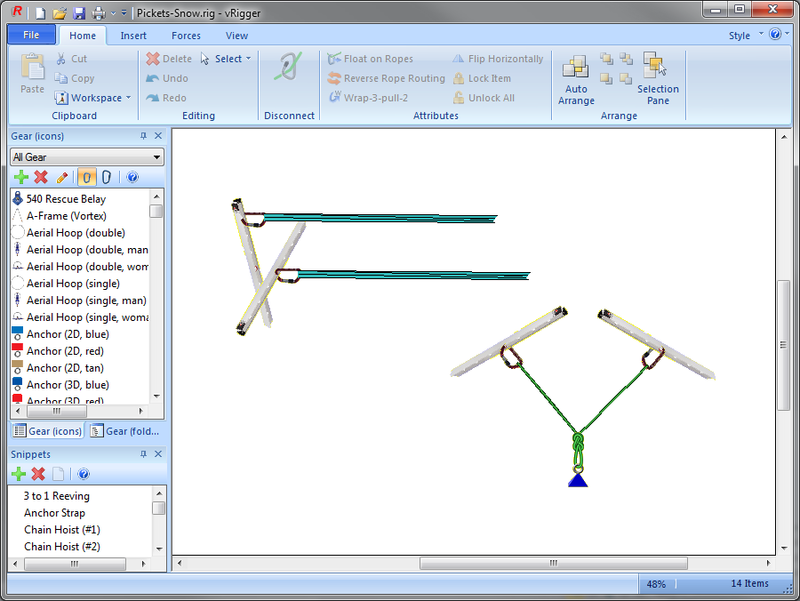 This file displays a system with 4:1 mechanical advantage. 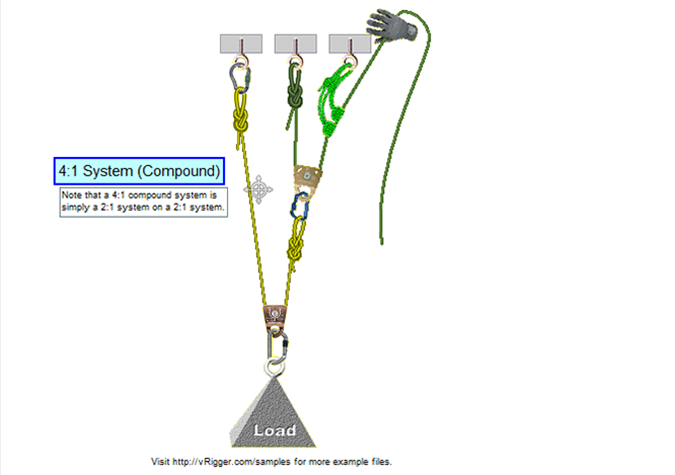 This file displays a system with a compound 4:1 mechanical advantage. 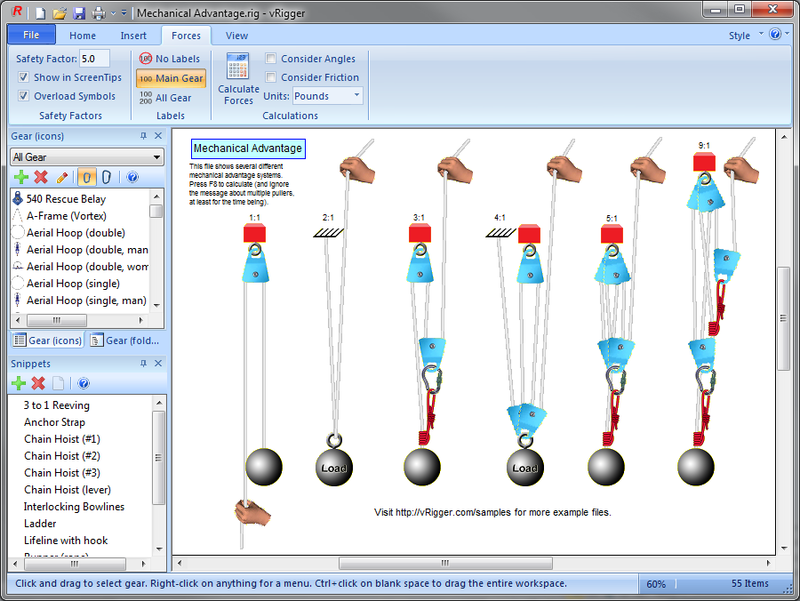 This file displays systems with 1:1, 2:1, 3:1, 4:1, 5:1, and 9:1 mechanical advantage. 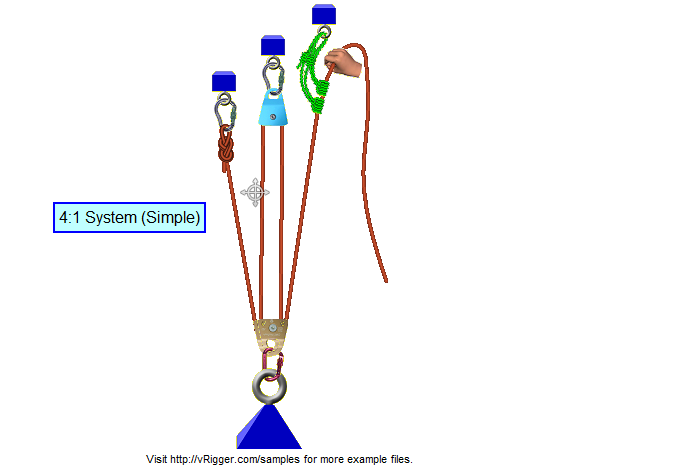 This file explains how to create a block and tackle mechanical advantage system using a pulley with a becket. The adjustable Prusik hitch lets you create a Prusik with any length loop. It's a little complicated to use (and can't be used in force calculations), but it is very versatile. This file shows how to use the two barrel knots. 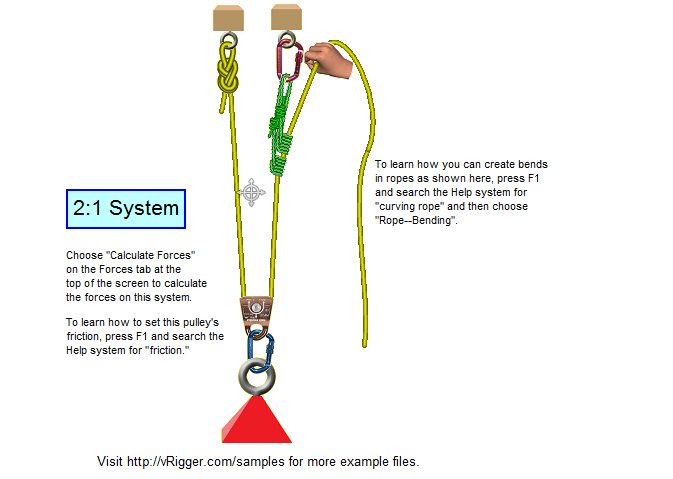 Using these knots require you to connect the rope to the knot twice and then use the "rope benders" to create the knot's loop. 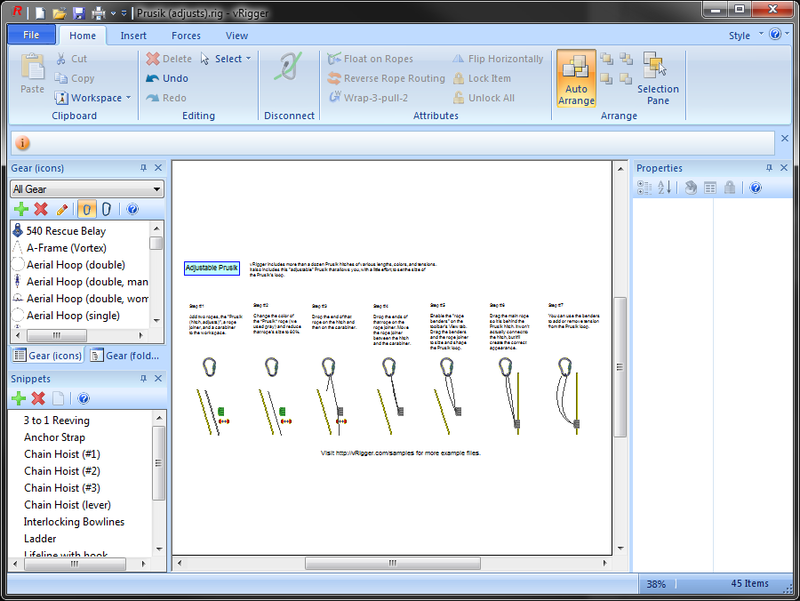 This file shows how to use the "Knot (bowline)" knot. Using this knot requires you to connect the rope to the knot twice and then use the "rope benders" to create the knot's loop. 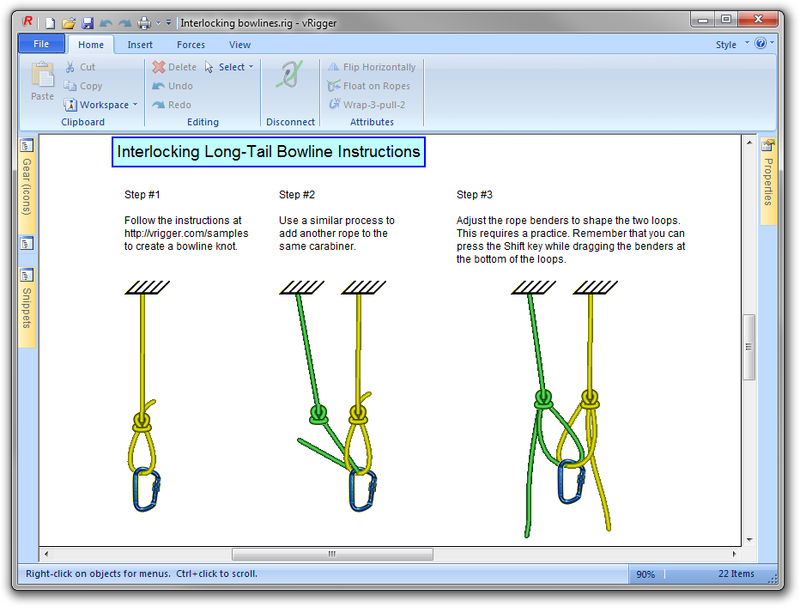 This file shows how you can create two interlocking bowlines. 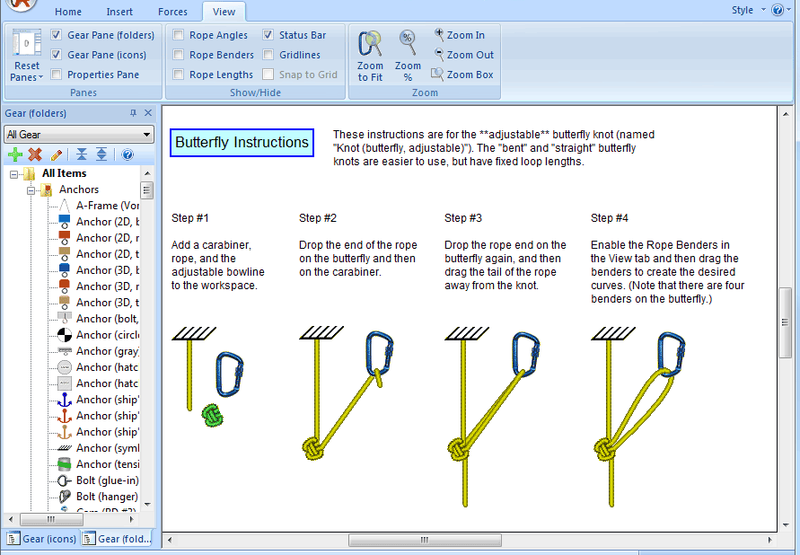 This file shows how to use the "Knot (butterfly, adjustable)" knot. 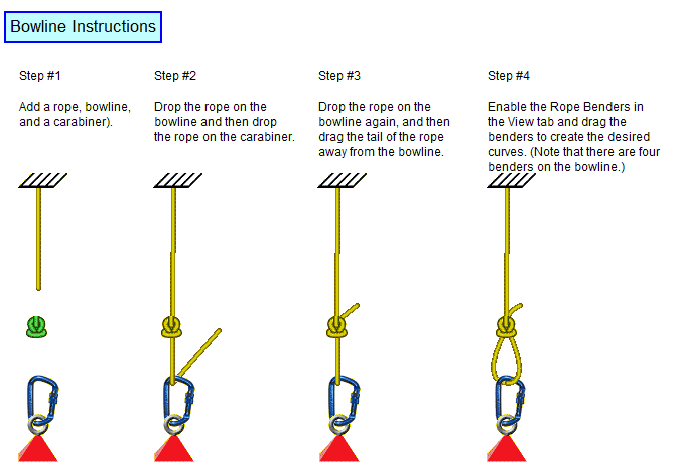 Using this knot requires you to connect the rope to the knot twice and then use the "rope benders" to create the knot's loop. 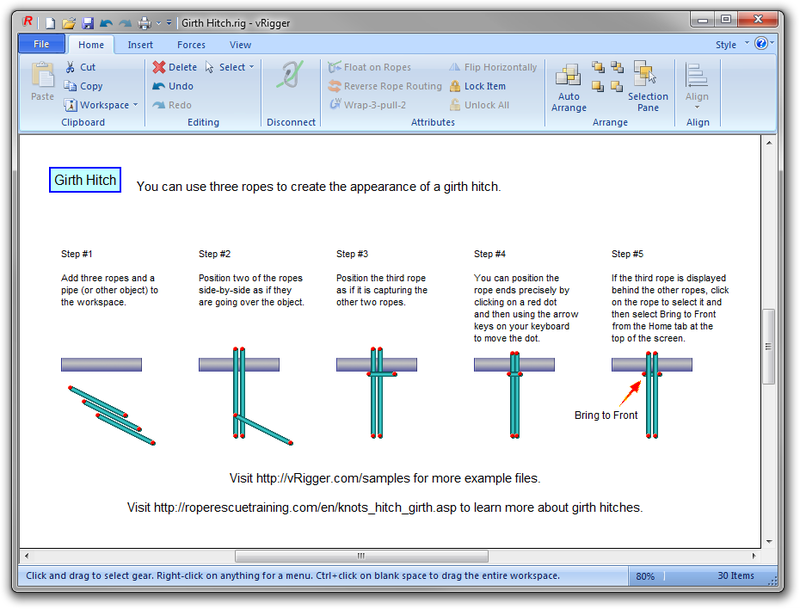 This file shows how to create the appearance of a girth hitch using three ropes. 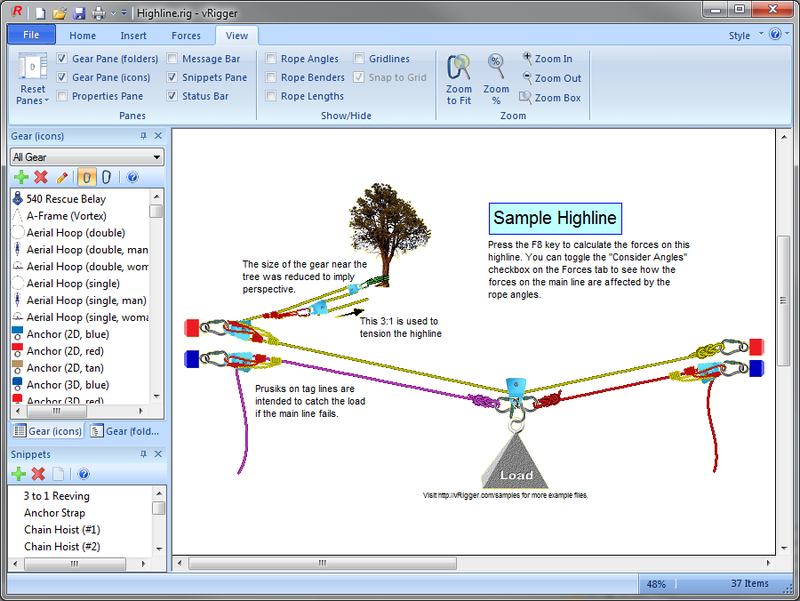 This is a fairly simply highline system. 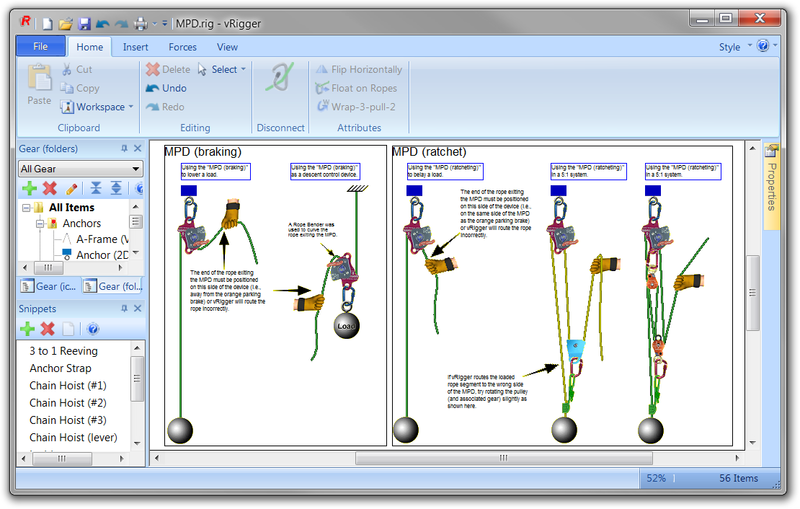 This file shows how to work with a load releasing hitch that has an adjustable length (the other load releasing hitches in vRigger have fixed lengths). 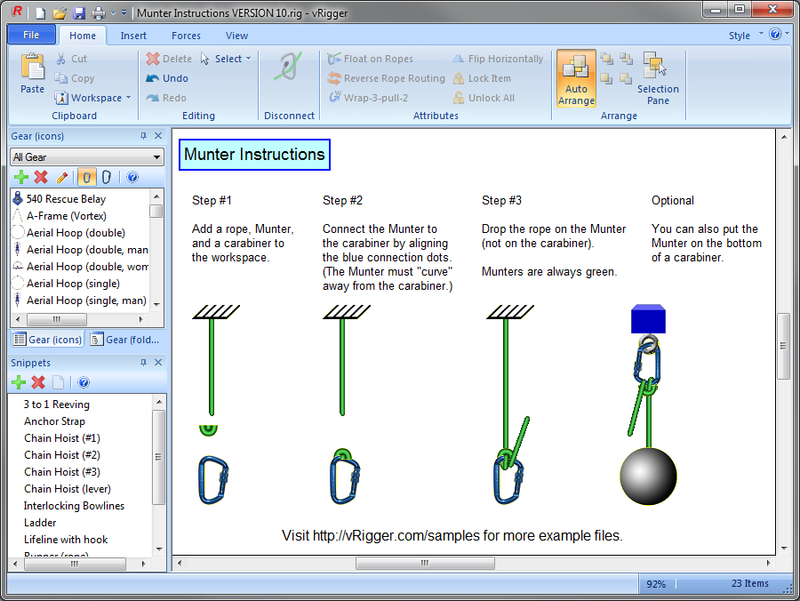 This file shows how to use the "Knot (Munter)" knot. Using this knot requires you to first connect the Munter to a carabiner and then connect it to the rope. An overhand knot is a good safety knot (as are barrel knots). 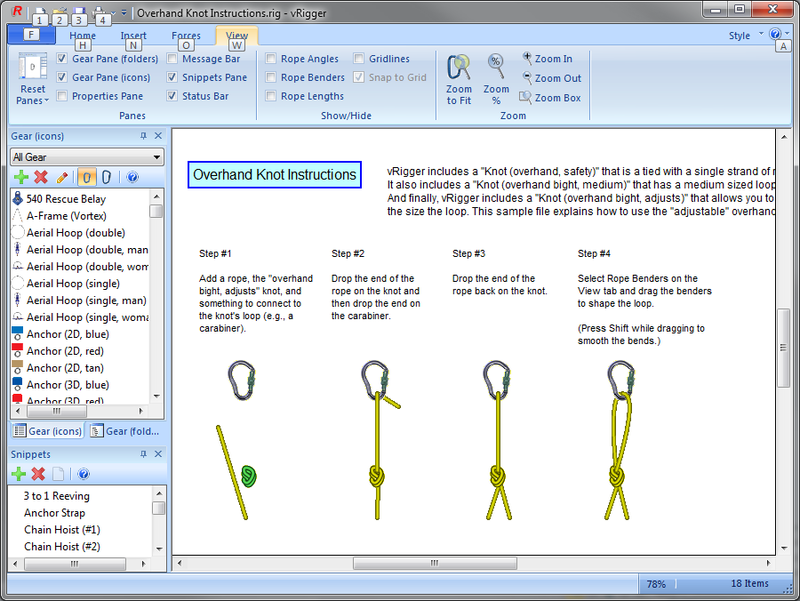 This file shows how to use the overhand knot as a safety knot. This file shows how to use the "Knot (F8 two loop)" knot. 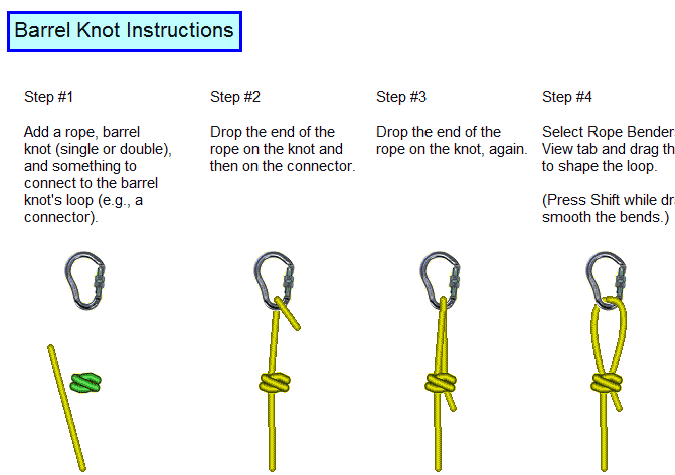 Using this knot requires you to connect the rope to the knot twice and then use the "rope benders" to create the knot's loop. 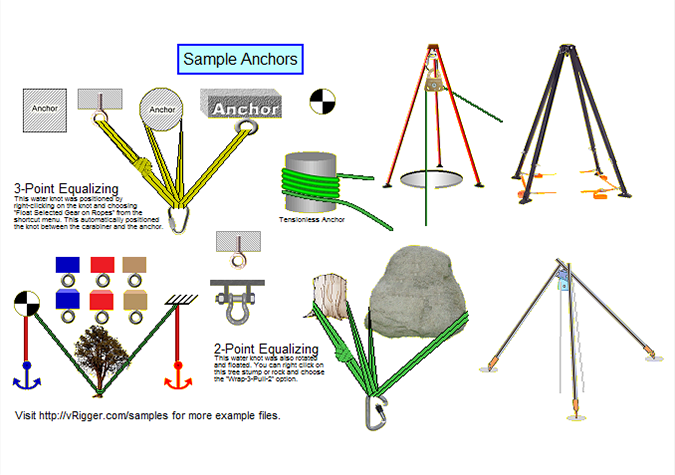 This file shows a variety of anchors that are included in vRigger. 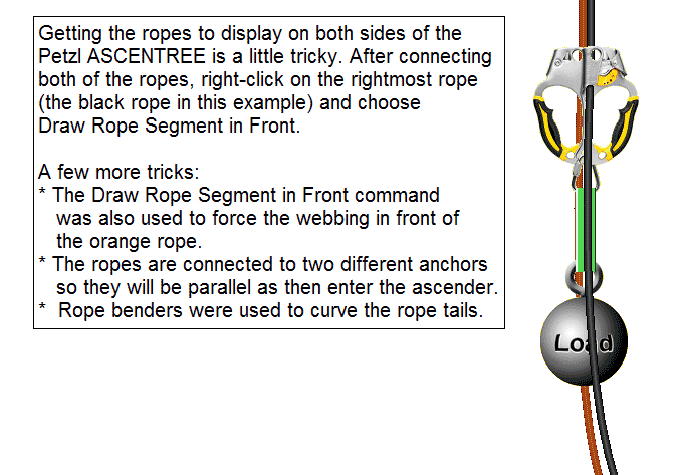 This file shows how to use the "Ascender (Petzl Ascentree)" ascender. It includes several tips to get the ropes to appear on the correct side of the ascender. 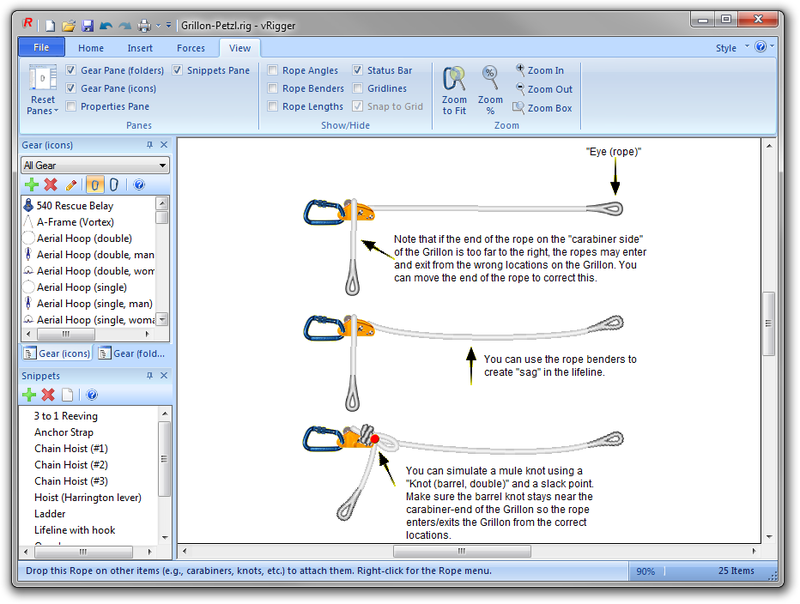 This file shows how to use the "Grillon (Petzl)". 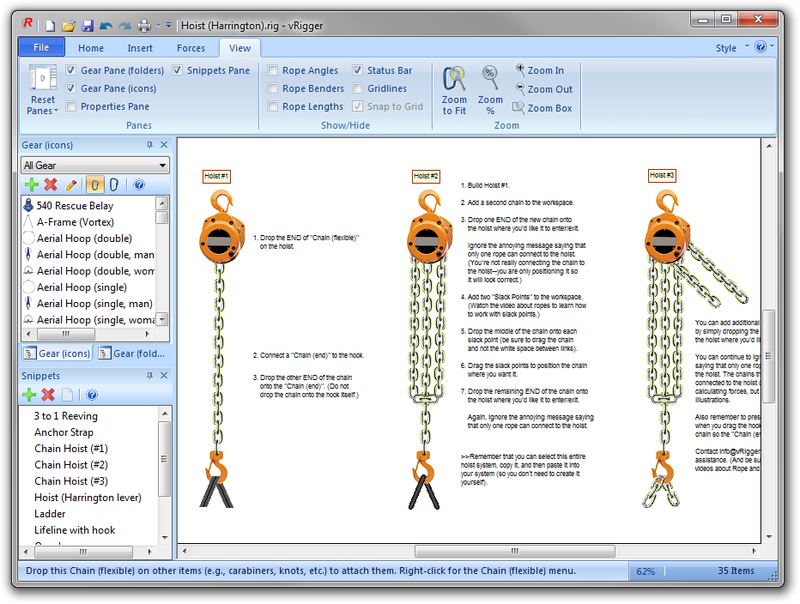 This file shows how to work with the Harrington chain hoist. 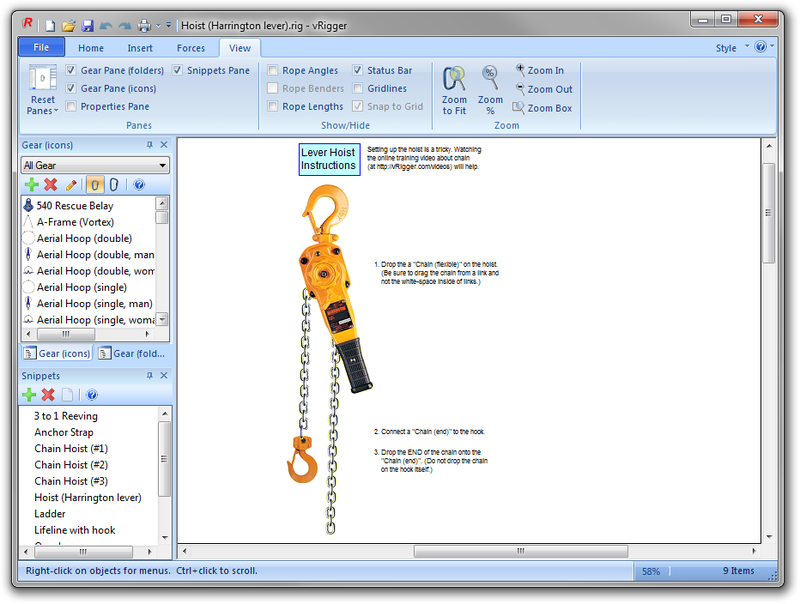 This file shows how to work with the Harrington lever hoist. 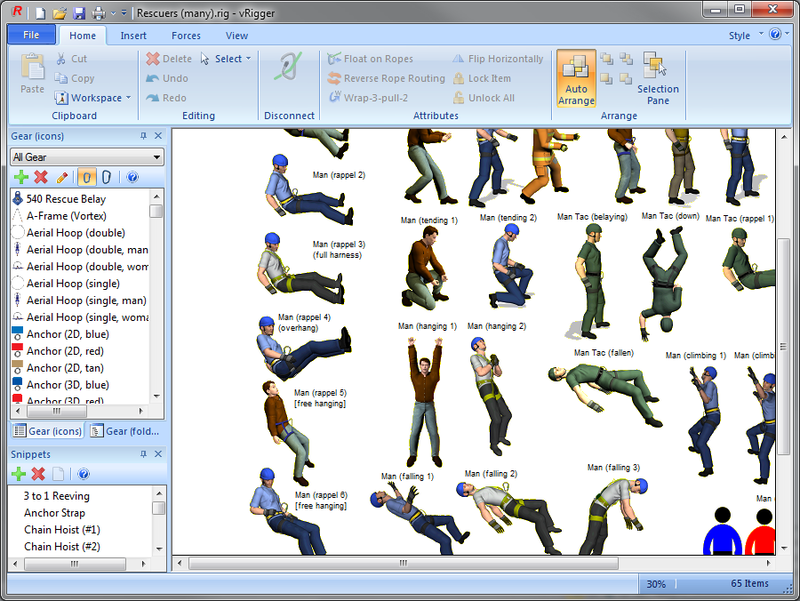 This (large) file shows almost all of the men that are available in vRigger. Click on the "View" button to see this image. 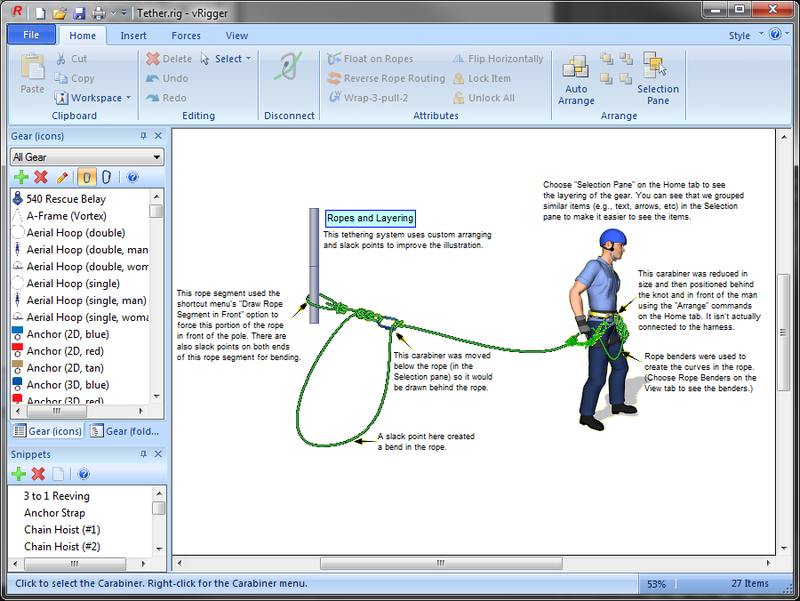 This file shows how to use the CMC MPD to lower, descend, belay, and raise. 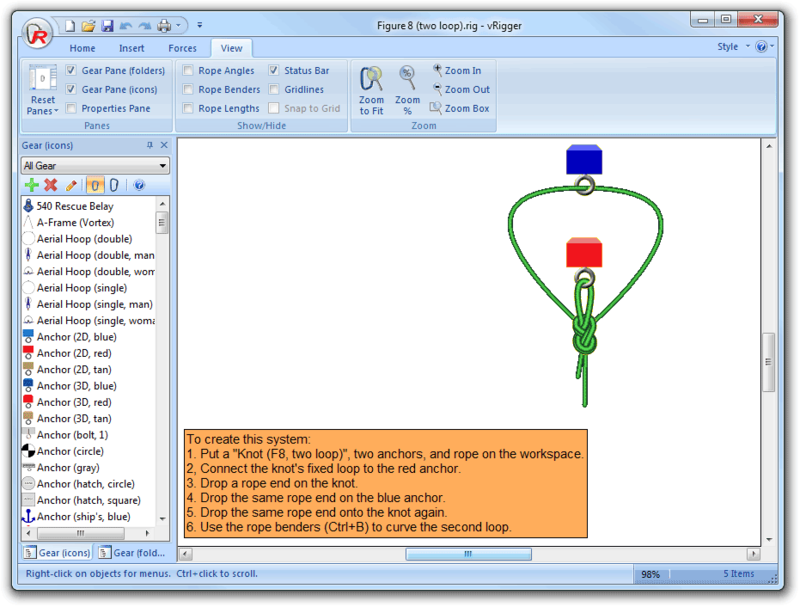 When you create a system using the MPD, make sure the loaded rope segment always comes out on the correct side of the MPD (i.e., away from the orange "release" lever). 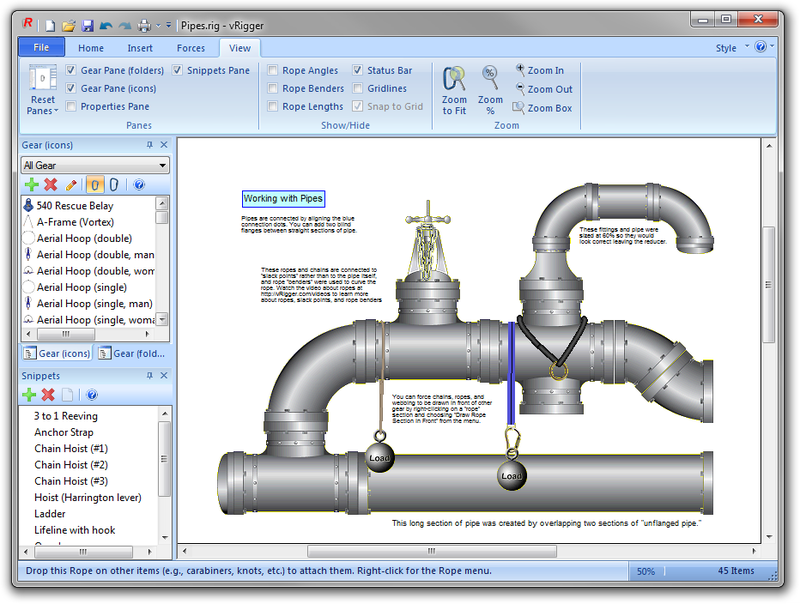 This file shows how to work with pipes and fittings. 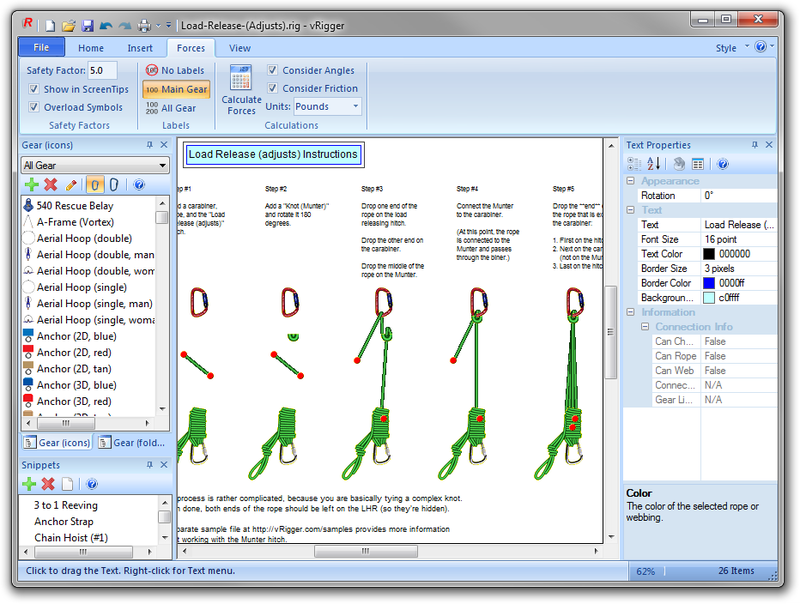 This file shows several different ways to use the snow pickets. 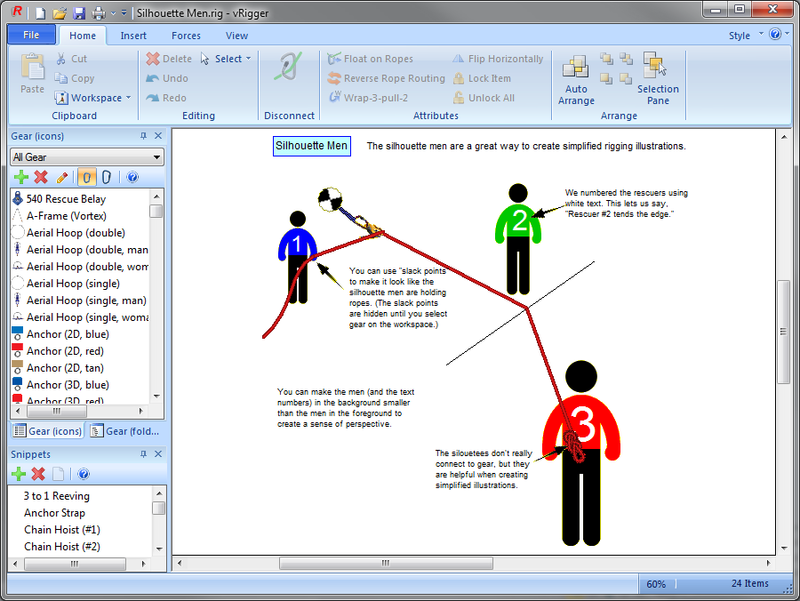 These four silhouette men are great for creating simple, easy to understand illustrations. 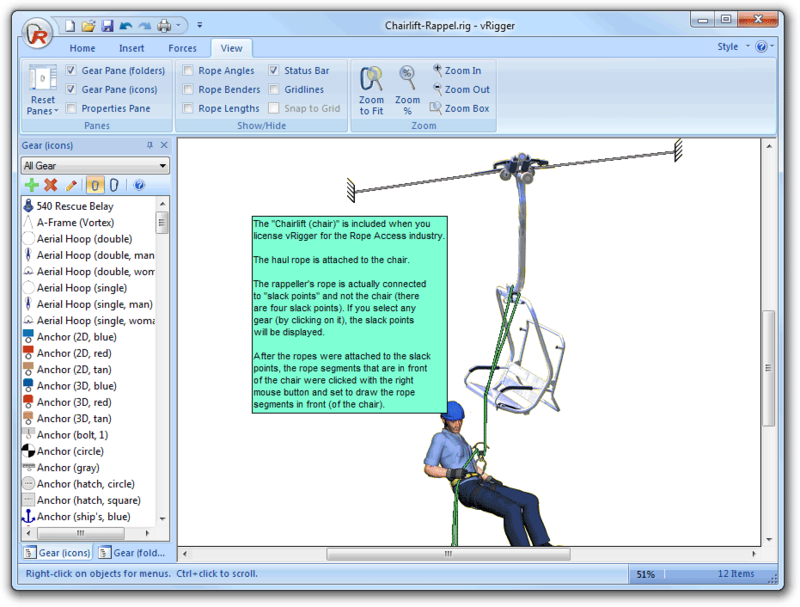 This file contains a man rappelling from a chairlift. Instructions in the file explain how the rope was routed around the chair using "slack points". This file shows how you can draw a confined space using the "Shape (ellipse)" and "Shape (line)" items. 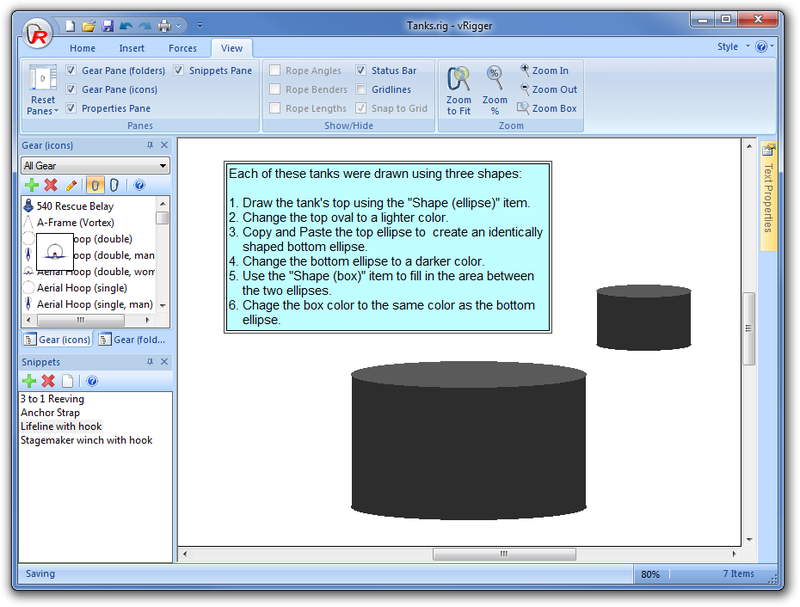 This file shows how you can create storage tanks using the "Shape (ellipse)" and "Shape (box)" items. 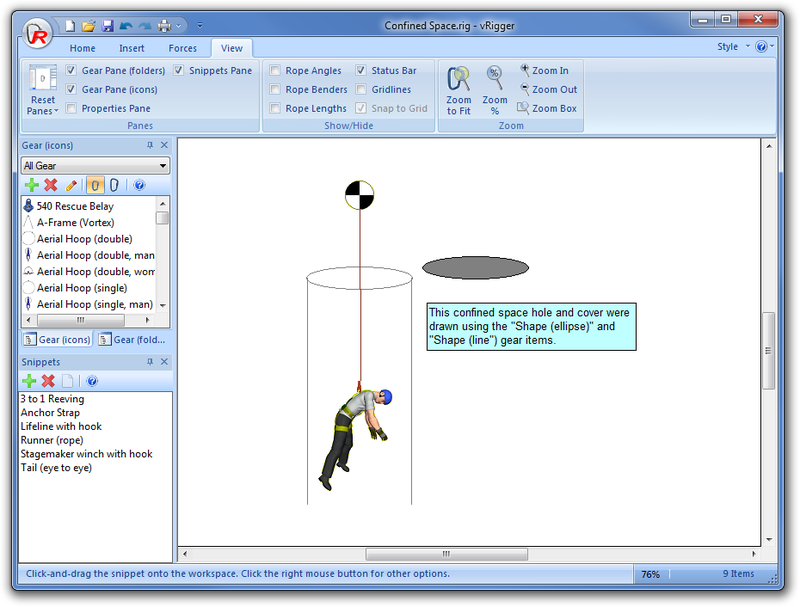 This file shows one way of creating a safety tether.